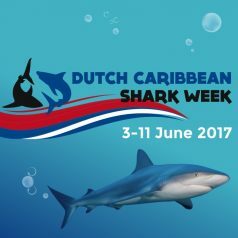 The Save Our Sharks project will organize the third Dutch Caribbean Shark Week from June 3-11, 2017, simultaneously on six Caribbean islands and in the Netherlands. The week will be filled with activities and events taking place in Aruba, Bonaire, Curaçao, St. Maarten, Saba, St. Eustatius, and the Netherlands. All activities are set up to highlight sharks and their importance for the oceans. Throughout the week there will be various fun and educational activities, including treasure hunts, shark quizzes, beach walks, diving trips, lectures, film nights and cocktail parties. An entire week filled with science and educational fun. For example, in the Netherlands you can join an eggcase hunt, shark tagging on the North Sea, a movie premiere, a treasure in the Royal Burgers’ Zoo, and children visiting Sea Life Scheveningen can test their knowledge about sharks with a special shark quiz. On Curaçao, activitesis for both adults and children are organized in collaboration with the local marine aquarium and the Sambil shopping center. On St. Maarten, there will be several shark themed events and actual shark dives. In addition, schools on the islands will have class visits from shark experts. On Bonaire, the Junior Rangers made a film about the coral reef and at the Washington Park Museum a shark exhibition is set up where children will be trained to become an ambassador for sharks. On Aruba, the visitor center of the Arikok national park is decked out with shark info and on Saba, the entire island involved in the week. On St. Eustatius, the shark week will literally be the center of attention with a large shark headquarters in the middle of Oranjestad. And this is just a fraction of the total program. All activities are meant for young and old and for existing and new fans of these special and valuable animals. Project Ambassador Jörgen Raymann will visit the Caribbean islands during Dutch Caribbean Shark Week, and on Aruba and Curacao, he will perform his latest show, “Zo Kan Het Ook” (in Dutch) as a contribution to the local marine conservation organizations. After more than three years, Raymann is back on stage with a solo program. Raymann is turning 50 this year and although his looks may have changed since his thirties, he has not reached his midlife crisis. Or has he? He has reached that age where everything is just a little different than before. You never thought that getting older could be fun? According to Raymann, it can. Getting older is okay, your marriage can get more enjoyable over the years and life gets even better than before! 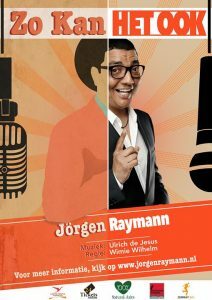 For one evening, come philosophize with mister Raymann and let go of the madness that was your day. Raymann says life will laugh at you, as long as you dare to laugh back at it! Tickets for the shows on Aruba and Curacao can be purchased locally.